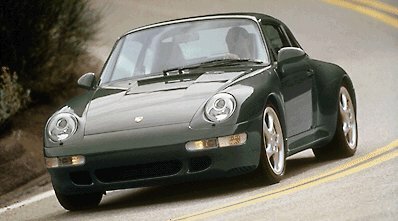 The 911 Carrera 4S is the same as a Carrera 4, except for a few changes. 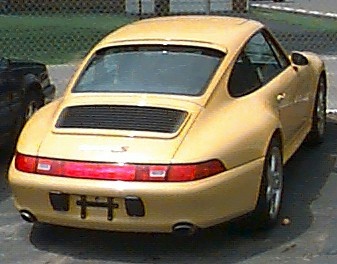 It has the bodywork of the 911 Turbo, except for the whaletail. As you can see, the fenders are flared, and the front air dam is straight from the Turbo. The wheels look identical to the Turbo's, except they aren't. The C4S' wheels are not friction welded, and do not have hollow spokes, like the Turbo. The result is a feast for the eye. It has the four-wheel drive of the Carrera 4, and suspension which has been lowered 10 mm at the front and 20 mm at the back. It also has the incredibly powerful braking system of the 911 Turbo, with red brake calipers. It also comes with the dynamic differential system of the 911 Turbo as standard. As well as air conditioning, trip computer, all-leather interior, electric seat adjustment, rear windscreen wiper, and the radio/cassette stereo sound system. Sports seats are available at no extra charge. Otherwise, like on the Carrera 4, the indicator covers are white at the front and red at the back, the wheel centres feature the new logo, and the gear lever inlay is silver coloured. The 911 Carrera 4S thus not only looks great, it also offers impressive technical features and is lavishly equipped. The engine is the normally aspirated 3.6 liter, like in the normal C4. 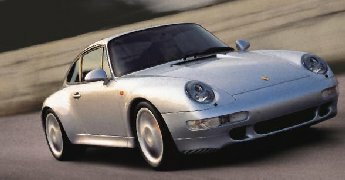 This model was offered as special edition in 1996, but in 1997 will take the place of the regular C4 Coupe, and will be the only AWD Carrera Coupe available.